Produced with funding from CONSTRUCT and filmed at Imperial College London. At the end of the video a graph of vertical load versus vertical deflection shows the point at which brittle failure occurs. This experiment is an indirect tensile test. 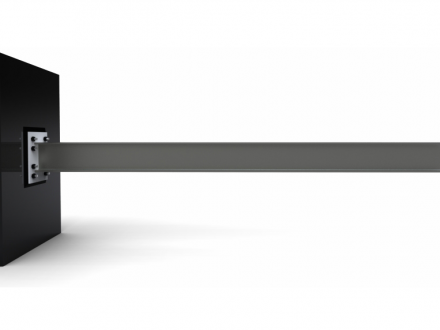 The compressive force applied along the top and bottom side of the cylinder causes a tensile crack to open up in a direction perpendicular to the direction of the compressive force. 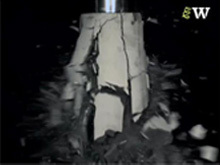 It is difficult to carry out a direct tensile strength test on a concrete cylinder. It could be carried out using the same apparatus as used for the concrete cylinder compression tests, setting the machine to operate in reverse; however the sample needs to be glued to the platens at the top and bottom so that the tensile force can be applied to the sample. Not only is this tricky to do, the platens tend to affect the behaviour of the concrete. 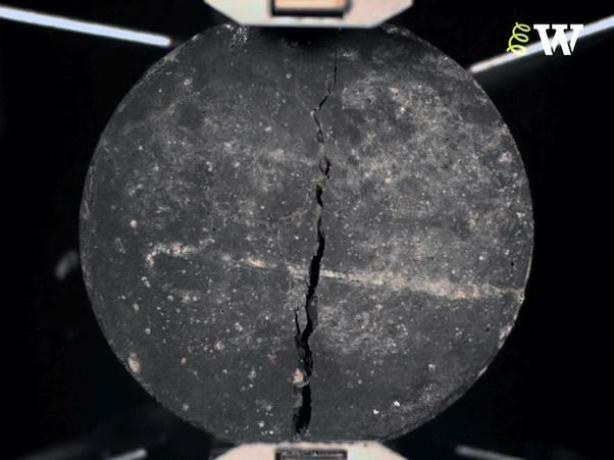 Compare the strength of concrete in tension with the strength of concrete in compression by seeing the film ‘Cylinder (ordinary concrete) – compression failure’. 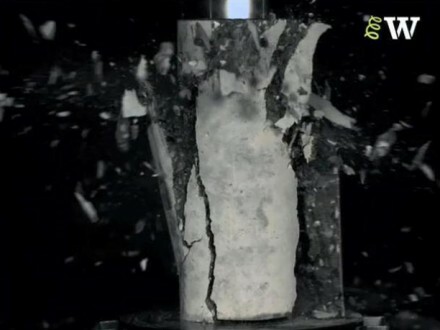 Compare the strength of concrete in tension with the strength of steel reinforcement in tension by seeing the film ‘Reinforcement (high-tensile steel) – tensile failure’. You can use the data in the graph shown at the end of the film to calculate the tensile failure strength of concrete, and compare it with compressive strength of the same mixture.